This print combines two printing techniques for a singular layered result. 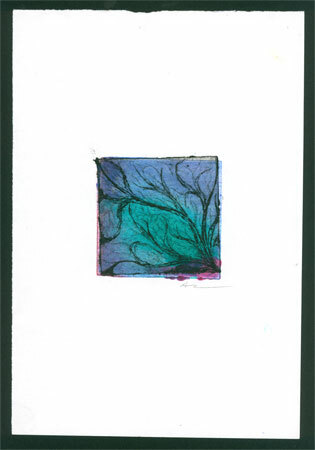 First the colors were painted onto a blank acrylic plate with monoprint inks and the piece was run through the printing press. Then, a deep-bite etched intaglio plate was inked and the already-printed page was run through a second time, which left the textured black impression overlaying the color. It can be a very precise process, but I never was a very precise artist, so you can see that the two plates don’t quite align on the page, which accents the loose style of the print itself. 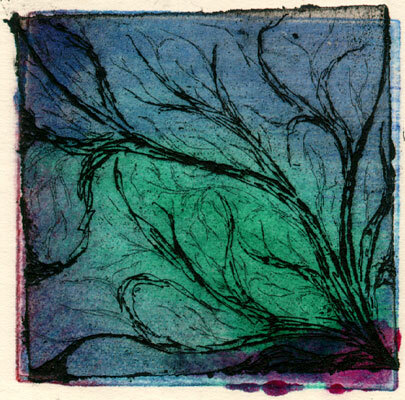 Ogdred Weary, 3″x3″ etching and monoprint on 7″x10″ watercolor paper.